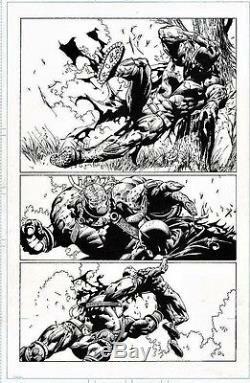 A great looking page from Batman: The Dark Knight pencilled by David Finch and inked by Richard Friend. 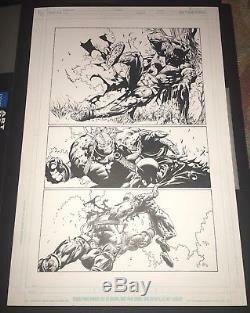 The page depicts Batman getting tossed around by an amped up Bane! The item "BATMAN DARK KNIGHT #6 PAGE 19 BANE ORIGINAL COMIC ART david finch" is in sale since Saturday, December 02, 2017. This item is in the category "Collectibles\Comics\Original Comic Art\Splash Pages". The seller is "jacquay" and is located in Tucson, Arizona. This item can be shipped to United States, Canada, United Kingdom, Denmark, Romania, Slovakia, Bulgaria, Czech republic, Finland, Hungary, Latvia, Lithuania, Malta, Estonia, Australia, Greece, Portugal, Cyprus, Slovenia, Japan, China, Sweden, South Korea, Indonesia, Taiwan, South africa, Thailand, Belgium, France, Hong Kong, Ireland, Netherlands, Poland, Spain, Italy, Germany, Austria, Russian federation, Israel, Mexico, New Zealand, Singapore, Switzerland, Norway, Saudi arabia, Ukraine, United arab emirates, Qatar, Kuwait, Bahrain, Croatia, Malaysia, Brazil, Chile, Colombia, Costa rica, Panama, Trinidad and tobago, Guatemala, Honduras, Jamaica.